For the second year in a row, Google is named a Leader in the Gartner 2018 Magic Quadrant for Content Collaboration Platforms (CCP). Google Drive enables intelligent and secure collaboration in the cloud, so enterprises can save time and focus on work that matters. We lower barriers to transition by making it easy to migrate and securely work with Drive. 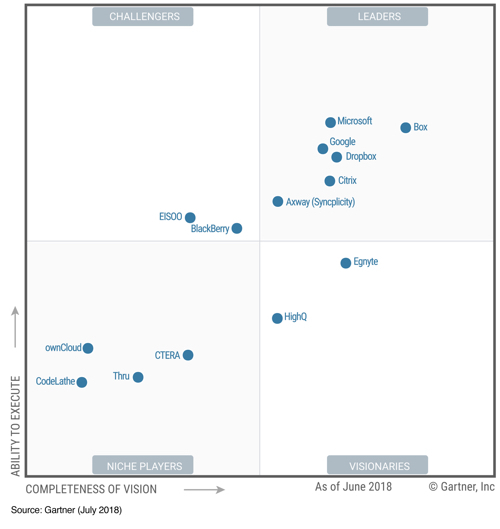 We believe our continued focus on our customers and enterprise needs reflects why Google has been named a Leader in the Gartner CCP Magic Quadrant 2018 report again. We are proud to receive this recognition amongst the vendors evaluated by Gartner. Get your complimentary copy of the report by filling out the form.